Continuing my reviews of the Eric Shanower / Skottie Young Oz comic adaptations for Marvel, we come to Road to Oz. The quality of the Oz books thus far has depended largely on the source material more than anything else. And by modern standards, I can understand how a lot of folks might find the classic Oz tales a little too whimsical, bordering on the rather silly. But there's a particular charm to the Oz stories, one that I feel Shanower and Young have managed to capture quite well across their titles. Road to Oz is one of the lesser known parts of the classic Oz history for one reason or another. As much as this book seems to introduce many classic characters that have greater roles in latter books (and even their own books as well), it's not exactly one that folks immediately remember when you start listing Oz books. But leave it to the Marvel Oz team to remain faithful to the original publication order by investing in this particular project. On a side note, it sort of surprises me how few discussions there are of this comic even two years after its initial release. You can't find a decent Wikipedia page for one and the discussions around it seem to relate more to its creators in one way or another. Rather strange indeed. 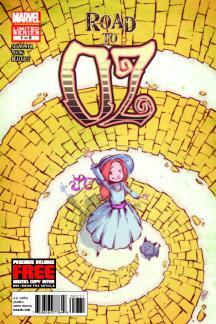 Synopsis: Road to Oz is a 6-issue limited comic book series based on The Road to Oz by Frank L. Baum. It was adapted by Eric Shanower with art by Skottie Young. Our story begins in Kansas, as is often the case, and Dorothy Gale finds herself on yet another dusty Kansas road. On her way she encounters the Shaggy Man, who is a sort of wandering hobo who claims to be carrying around a Love Magnet for some reason or another. The Shaggy Man's only destination at this point appears to be avoiding the town of Butterfield. They then come across 7 different paths and take the last one and eventually meet Button-Bright, a little boy with a penchant for getting lost. And the last companion that they meet along the road is Polychrome, the Rainbow's Daughter. She managed to get stranded after dancing off the edge of the Rainbow just before it faded away. Dorothy understands the signs of another impending adventure in Oz well enough and almost on cue they arrive at Foxville, a community ruled by foxes. And these aren't your typical foxes - they walk around on their hind legs and talk just as well as any other human. They seem to be nice enough folk and share with Dorothy that everyone is excited for the coming birthday celebration of Ozma of Oz. But for one reason or another they start to take a liking to the simple-minded Button-Bright. And the foxes have a particular view of what such a boy deserves given his roundabout cleverness. And this is only the beginning of their adventure to go join Ozma for her birthday. Again, the core story of this book isn't saying much - it follows the now classic Oz formula of our primary adventurer (typically Dorothy) wandering into Oz and meeting companions along her way who help her get to the Emerald City. And the rest of the book is filled with unusual encounters with the rather unique residents of Oz. Thus a lot of the book depends on the quality of the companions and the creativity that goes into the different Ozians that they meet along the way. I'll always have mixed feelings about the Shaggy Man of Oz. He's a rather prevalent character in later Oz titles for some reason - I guess the sense of romanticizing hobos has something to do with the time period the book was originally written. But he's an odd character with no real distinct qualifications apart from the fact that he looks like a mess. If anything Polychrome was a much more fascinating character, but her role in this story felt a little limited despite her rather innovative nature. It has been nice to focus on Dorothy in these adventures given how regular her trips back to Oz seem to be. And while there's more than enough room for other human companions to explore Oz, the fact that these books focus on introducing so many new characters at once, it's somewhat reassuring to have a familiar character like Dorothy still in the tale. And as much as the story was a tad lackluster, the quality of the art continues to shine in these books and help make up for my other complaints. The foxes of Foxville were downright adorable despite their unusual practices and odd use of magic. And the rest of the Ozians brought into this tale were certainly beautiful in their comic book renditions. And of course Ozma's birthday party at the end was just a visual feast. Road to Oz is still lovely addition to Marvel's Oz titles but not quite my favorite. It's definitely a great visual way to get kids into the joys of Oz and one that keeps things fresh and oh so colorful. Thus the book gets a good 3 unusual head switches performed out of a possible 5.